This is the tenth time that the RAM Friends have sponsored this award to assist "the most talented young musicians of their generation". Tonight they have struck gold! I have had previous opportunities to see Tanya Gabrielian at work in master classes with Prof Satz and Pierre-Laurent Aimard; on both occasions her receptivity to suggestions made her stand out. At first I was a little confused; was this the same pianist I was expecting to see, whom I'd recalled being associated with romantic Spanish repertoire? Once she'd adjusted the piano stool, checking exactly how far from the keyboard to sit, Gabrielian played without any distracting gestures, her back tall and straight. No matter, Papillons was idiomatic and lightly textured, with flair in her phasing going well beyond accuracy and assurance. The other choices were unusual; how often do you hear in recital this lengthy A minor Schubert sonata, never amongst the more popular? * It has a certain austerity, which can be a positive feature, especially in the first movement. For me, Gabrielian was a little over expressive as it began, but soon settled down to a steady tempo, the melody puctuated with stabs in the bass. For the rest, her decisions were just and the pianism assured and the whole account fully integrated. A fine first half, but nothing prepared us for Rachmaninoff's 1st piano sonata, with a scenario from Goethe's Faust, after the interval. This is not a piano recital regular and I do not remember having encounterest it before. The composer thought it "wild and interminabaly long" and that no one would ever play it... Well, it has certainly not achieved a place in the repertoire, as has the 2nd in both original and revised versions. So the field is relatively clear. Gabrielian's performance was revelatory, a feast of romantic pianism which held us enthralled. Rich full tone, but never straining or too loud for Wigmore Hall; a profusion of melodies supported by elaborate swirling arpeggiated accompaniments, creating an orchestral feel. Pedalling immaculate to support her articulation; as good a sound in Wigmore Hall as we have hear for many a month. This should be followed up with a recording, hopefully in as sympathetic acoustic as Wigmore Hall, and with the microphone not too close. The only incongruity was that this powerhouse was unleashed without any visible means by a slender young woman who sat still at the piano, with a tall, straight back; for some of us, that at odds with the emotionality of the music. The explanation of my confusion is revealed below. It would seem that Tanya Gabrielian had taken to heart Aimard's advice to sit with a 'centred' posture, relaxing to enable production of tone that must not be 'blocked', and checking with a mirror. I questioned whether practising with a mirror might risk undermining her spontaneity? On this showing, no harm had been done by her drastic alteration of platform manner; it was however noticeable that Tanya Gabrielian began to move a little more freely only in her encores. Those were typically adventurous; a small piece by Bartok (not fully identified) preceded by a witty Schedrin Humoresque - Tanya played that with far more point than does Krassimira Jordan on an Albany CD I've tracked down (sample on Amazon! ); just right to bring us back to earth after Rachmaninov. - - At the Ricci Foundation's evening Piano Masterclass at the Royal College of Music, Prof Satz had a second Steinway alongside his pupil's piano, and illustrated his thoughts copiously, sometimes playing along with his 'victim' - - he subjected them to what often seemed impossible demands for immediate response, usually of a subtle musical nature, often described in metaphor and not unkind caricature, especially seeking to combat too rigid and mechanical rhythm - - Of those I heard, Tanya Gabrielian was able to reach deeply into the essential Spanish romantic character of Granados (El amor y la muerte) and one felt her interpretation grow by the minute. None of the three pianists had any problems with Aimard's demands to take particular passages without the scores, and to try to modify their approaches in subtlest ways and before an audience - - Aimard emphasised the importance of 'centred' posture, 'opening' the chest and relaxing to enable production of tone that must not be 'blocked'. 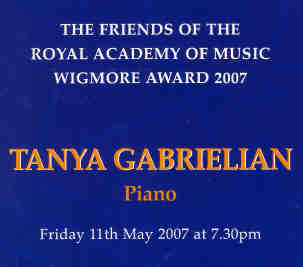 - - Tanya Gabrielian was the most interesting, her body mobile and her face expressive in responding to the changing moods of the music in a way that I felt was natural and not added for effect; I think we were all captivated watching and listening to her. Might not Aimard's advice that she should practise with a mirror be inhibiting and undermine her spontaneity? I look forward to hearing Tanya in recital. - - My regret was that the session was not recorded/or videoed - there must be substantial limits to how much of the tuition the pupils would have been able to take in and absorb during the lessons? * My best memories of Schubert's D 845 have been of Kathron Sturrock (founder of Fibonacci Sequence) in a rare solo recital devoted to that one work, and on CD Richard Goode (Elektra Nonesuch 79271) one of the favourite piano recordings in my collection (- - the pounding brutality of his unhurried first movement pointed straight ahead to Shostakovich - - Sunday Times). - - For Yakov Kasman, a true Russian, the emotional maelstrom of Rachmaninov's First Sonata is an opportunity to show the composer as a master of romantic polyphony as he voices and textures Rachmaninov's storms and calms with a pianism that epitomizes the finest Russian artistry. He can withdraw into the Lento 's shadow-land (or its final starry apogee) or hurl himself at the finale's savagely churning momentum with equal resource. - - Fiorentino strides through its formidable demands with consummate ease, and in the Lento (so reminiscent of the more delicately perfumed Preludes) there is much to be admired in Fiorentino's cantabile and beautiful phrasing.